Symbiosis comes with MySQL installed and running. It can be managed through a web browser using phpMyAdmin. 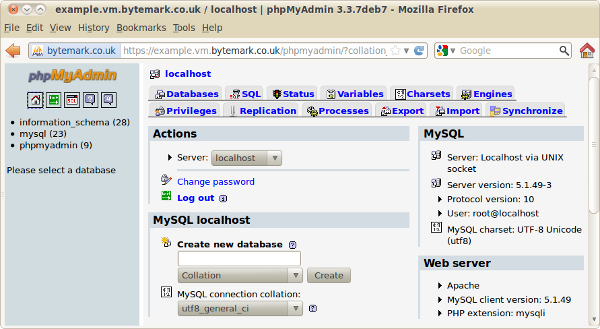 The following instructions describe how to connect to phpMyAdmin on a Cloud Server called ‘example.default.bytemark.uk0.bigv.io‘, but the instructions also apply to Dedicated Servers and Legacy Virtual Machines. Important note: If you have changed the admin password, it doesn’t have any effect on the MySQL root password. If you want to change the MySQL password, you can do so from within phpMyAdmin. Press the ‘OK‘ button to log in. From here new databases and database users can be created as needed. phpMyAdmin is further documented on its home page. You are currently viewing Symbiosis user documentation. Symbiosis also has a comprehensive technical reference manual. Do you know your database root password? In your web browser, go to example.com/phpmyadmin but replace example.com with the name of your server. You will be prompted for a username and password. Type in root as the username. If you’ve forgotten the MySQL root password, here are the steps to change it. You’ll need to be logged into your server via an SSH-client (eg, PuTTY). If using PuTTY, enter the Host Name (eg, myserver.default.example.uk0.bigv.io) and connect. When it prompts you for a user, type admin, press Enter, and type your password. If you’ve forgotten your admin password, contact us and we can reset it for you with 5-10 minutes of downtime. Run this command to generate a strong password and note it down. If you’re not quite comfortable with the instructions above, give us a shout and we’re more than happy to assist!